Photo: Landis House (Landis Valley Museum), ca. 1940, Manheim Township, Lancaster County, PA. Listed on the National Register of Historic Places in 1999. Photographed by User:Smallbones (own work), 2012, [cc-by-3.0 (creativecommons.org/licenses/by/3.0)], via Wikimedia Commons, accessed June, 2014. 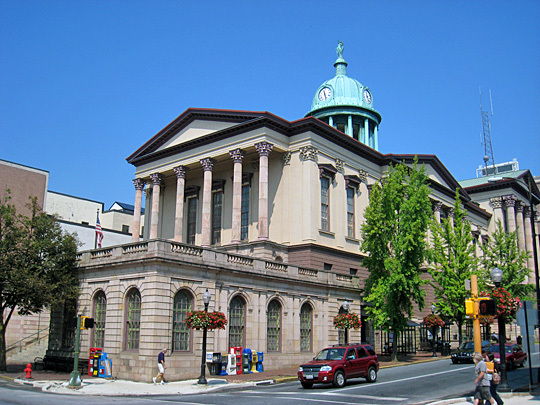 Lancaster County Courthouse is located at 50 North Duke Street, Lancaster PA 17602; phone: 717-299-8000. Formed May 10, 1729, by request of the proprietaries, on site of an Indian village; it was named for Lancashire, England, derived from Lan-Castra, the Camp at Lan, permanent camp of Roman occupation of Britain two thousand years ago. Earliest settlers, Swiss Mennonites, who, in 1710, had warrants for ten thousand acres of land on Pequea Creek; leader, Bishop Hans Herr; his stone house, built by himself on this tract, is still standing, with initials and date cut over front door, " C. H. H. 1719." A fine Mennonite meeting house, lately built, is here; on the grounds is a huge boulder, marked by the Lancaster County Historical Society. This is the richest agricultural county in the United States, of unexampled fertility; the tourist is impressed with the mammoth barns of this region; luxuriant crops of tobacco are of special note. The Conestoga River, with its affluents, drains an area of 315 square miles, it is crossed by many bridges. On the border of the city limits is a nine arch stone bridge, built by Abraham Witmer in 1800, which leads the Lincoln Highway over the Conestoga. At Pequea is St. John's Protestant Episcopal Church, according to a quaint old Vestry Book "Built of wood in 1729, to perform Divine Adoration ... after ye manner of ye Episcopal Church of England," the itinerant missionaries of the Society for the Propagation of the Gospel of England holding service; cornerstone of present church building was laid by Bishop Onderdonk, the rector at that time being Rev. Edward Young Buchanan, brother of President James Buchanan; the parish possesses two vestry books of great historic value. Most famous group of historic buildings are those erected by the Seventh Day Baptists, founded by Conrad Beisel in 1722, at EPHRATA, on the Cocalico; monastery still in original condition, with cells and rooms; and the adjoining chapel little changed; the brothers and sisters lived, each in their narrow cell, like monks of the Middle Ages; a printing press was set up in 1743, on which were printed the largest books in America prior to 1860; first Sunday schools in America were said to have been started here in 1740; and Henry William Steigel introduced glass making. Joining the Cloister Settlement is Clare Point Stock Farm, now occupied by the Redemptorist Fathers, a Roman Catholic order, founded in 1732 by St. Alphonsus Maria Leguori, in Italy; of strict discipline and singleness of purpose, designed to work among neglected country people; this is their only mission in Pennsylvania. County seat, Lancaster, 418 feet above sea, population 53,150; laid out by Governor Gordon in 1730: near by is the Conestoga River, named by Conestoga Indians, a tribe of the Delawares (Lenni Lenape); the Dutch who lived here invented the wagon, with big covered tops, drawn by six horses, and named it for the river. It is said that here was first given to Washington the title "Des Landes Vater." This is a square city, lines run north and south, east and west, with outlying districts; one, Rossmere, was named in honor of George Ross, a signer of the Declaration of Independence.